Porcelain Veneers - Dentist Hampshire, Southampton, Poole, Bournemouth. They are wonderful for fixing teeth that are significantly discolored, chipped, pitted, malformed, or crooked, or if you have unwanted spaces. In certain situations, a change in upper lip fullness and balance can be obtained by placing porcelain laminate veneers on your teeth. Veneers are usually created in a dental laboratory from an impression token in the dental office. During the first visit, the teeth are filed down a bit, impressions taken and are fitted with treatment temporaries while the veneers are being created at the lab. A special shade matching appointment is arranged at our lab. Using state of the art techniques the perfect shade is decided upon between the lab technician and yourself. 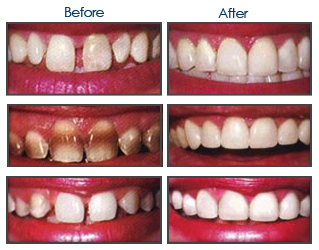 The veneers are then created, luted on, and polished to form a natural, aesthetic smile. Veneers are stronger and have a longer life than bonding, but the process requires more time.